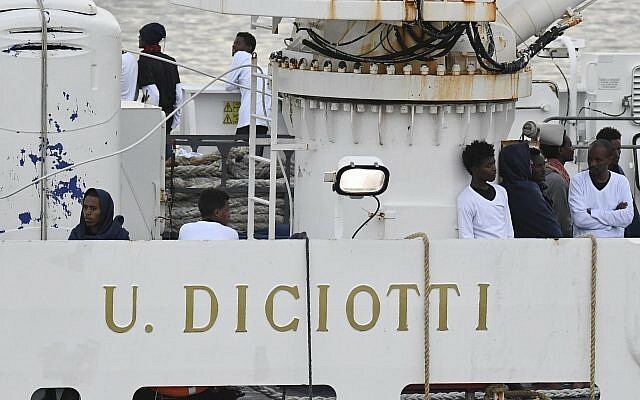 ROME — The United Nations’ refugee agency is imploring European Union countries to take responsibility for 150 migrants stranded aboard an Italian coast guard ship and urging Italy to let the migrants off the ship immediately. The Diciotti rescued the migrants from a trafficker’s boat on August 16. The ship has been docked in Sicily for days, and Italy’s government is refusing to let it disembark passengers unless other EU nations pledge to take them. Italy on Friday said it would pull its funding for the EU as a “compensatory measure” if the bloc refused to come forward and help with relocating the migrants. A high-level meeting of a dozen EU member states in Brussels on Friday, held to discuss what officials said was the broader issue of the disembarkation of migrants rescued at sea, failed to produce an immediate solution for the Diciotti migrants.